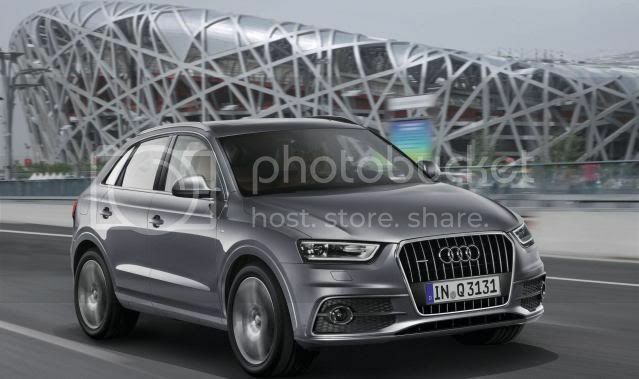 Audi has taken the wraps off the hotly anticipated Q3, ahead of its world preview at the Shanghai motor show. 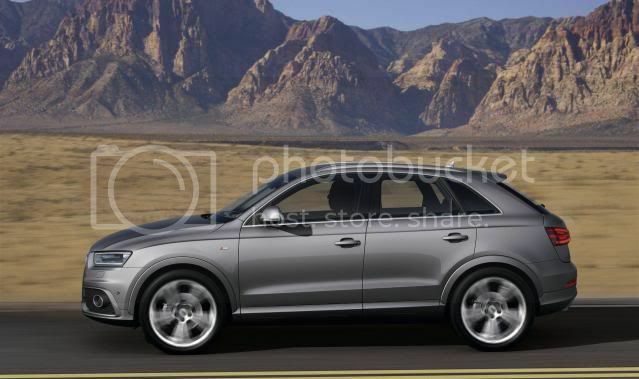 The Q3 is Audi's third devoted SUV, following the Q7 and Q5 – both of which have outsold initial targets worldwide. 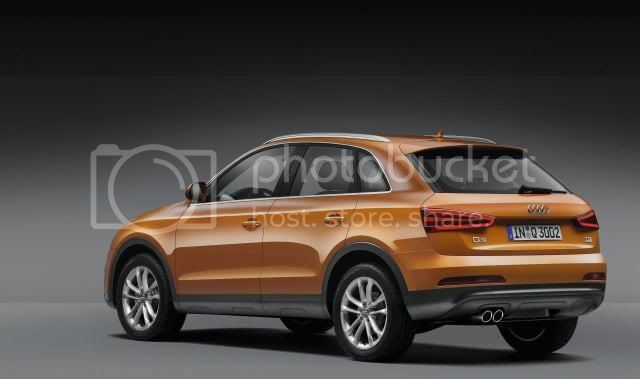 The newcomer shares the same architecture of the Volkswagen Tiguan, in addition to the same transversely mounted engines and gearbox combinations. 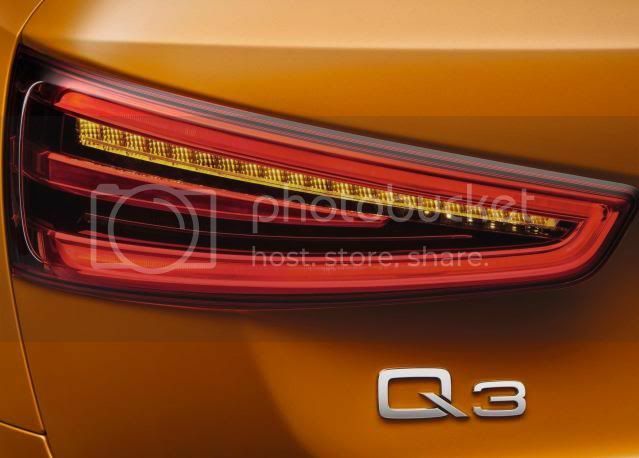 The new Q3 is 239mm shorter, 50mm narrower, and 53mm lower than the Q5 at 4,390mm (14.4ft) long, 1,830mm wide (6ft), and 1,600mm (5.25ft) tall. A claimed 1,500kg kerb weight for the front-wheel-drive variant is achieved by numerous weight-saving measures like aluminium bonnet and tailgate. Two specification levels will be available for UK Q3 models – SE and S line. The SE option builds impressively strong foundations, with 17" alloy wheels, contrasting painted bumpers, chrome window trims, aluminium roof rails, rear parking sensors, dual-zone climate control, Concert audio system w/6.5" manually retractable colour display screen, Bluetooth interface, Audi Music Interface iPod connection and light and rain sensors all present inside. The Q3 will also come equipped with navigation preparation, enabling customers to ‘activate’ navigation retrospectively by purchasing an SD card if required. The range-topping S line models features 18" alloy wheels, S line exterior and interior styling enhancements and xenon headlamps w/LED daytime running lamps and LED rear tail lights. Initially, three engines will be offered; a 2.0 TSFI with 168bhp (170PS/125kW), a 208bhp (211PS/155kW), and a 2.0 TDI with 175bhp (177PS/130kW). 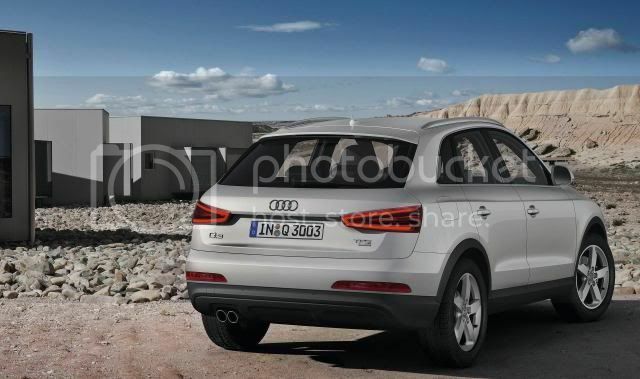 Later on, a 2.0 TDI with 138bhp (140PS/103kW) will go on sale. 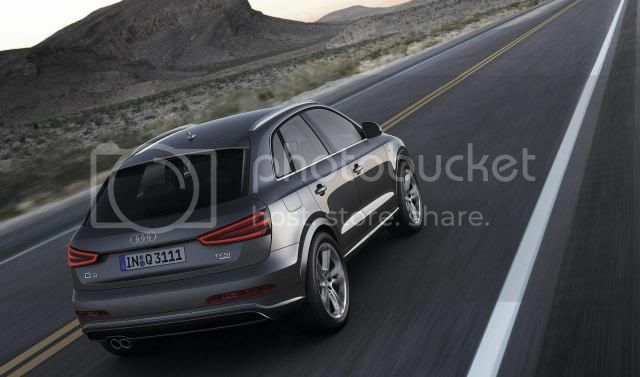 The more powerful petrol and diesel engine will only be available with Audi's Quattro four-wheel-drive, while other variants have the option of both front-wheel-drive and four-wheel-drive. Mated to these engines will be either a 6 speed manual or a 7-speed S-Tronic dual-clutch gearboxes. This allows for an average fuel economy figure of 54.3mpg (5.2l/100km). The four-wheel-drive system in the Q3 is utilised from a lighter and simpler Haldex multi-plate clutch system. Additionally, the ESP features an integrated electronic differential lock. 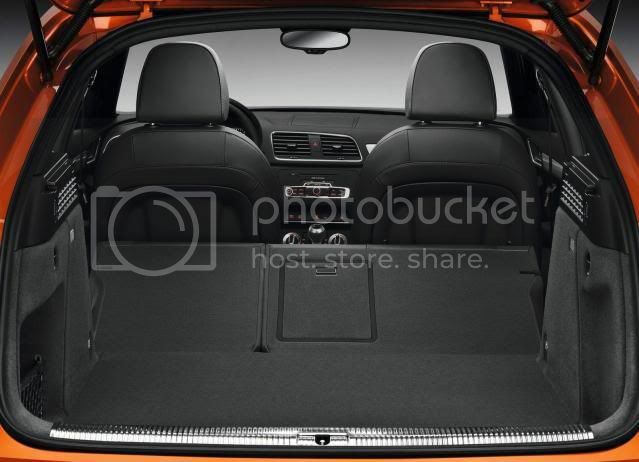 With space for upto five people, luggage space is rated at 460 litres, rising to 1,365 thanks to 60/40 spilt folding rear seats. Like every Audi in the line-up, an extensive range of options like leather upholstery, heated seats, on-board Internet access, aluminium trim, ambient lighting,14-speaker BOSE sound system, panoramic glass roof, parallel parking assistant, and MMI navigation w/7” touchscreen display. German sales and British order books start/open in June with prices starting from €29,900. Expected British sales to start in November with an entry price tag of £25,000. Production will commence in Martorell, Spain with an annual estimated sales target of 100,000 units. 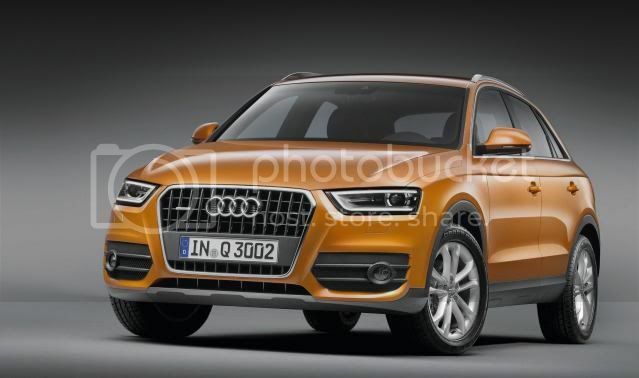 Audi is venturing into a new market segment: The Audi Q3 is a premium SUV in a compact form. It is sporty and efficient as well as versatile and trendy - a vehicle which feels right at home on or off any road. 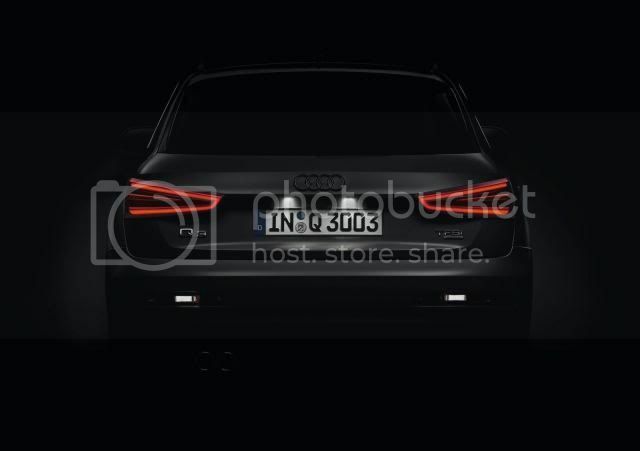 The Q3 showcases Audi's expertise in all aspects of engineering: from its lightweight body through strong and efficient drivetrains and a dynamic chassis to its state-of-the-art assistance systems and multimedia systems. Many of its features are straight from the luxury class. 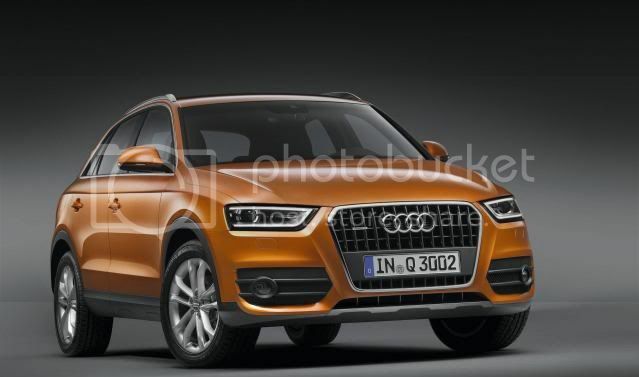 The Audi Q3 features the sportiest and most progressive design in its segment. The single-frame grille with its tapered upper corners dominates the front; its outline is extended by the dynamic curve of the engine hood. 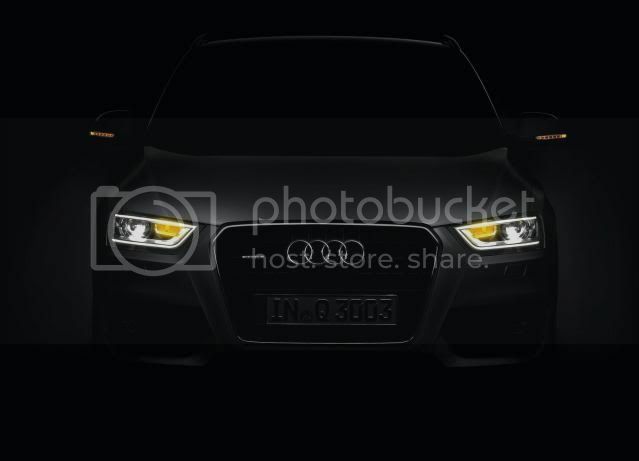 The wedge-shaped headlights are available as a xenon plus version including LED daytime running lights. Large air inlets hint at the potential of the engines. 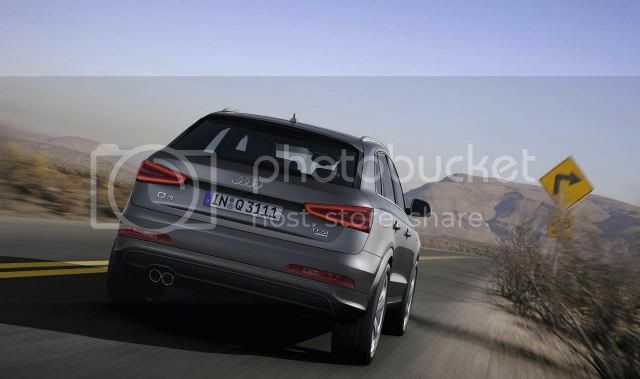 Viewed from the side, the Q3 similarly exhibits Audi's classic design characteristics. The tornado line divides the side underneath the windows. The dynamic line imparts additional flourishes near the side sills and the wheel arches have a muscular look. Metal constitutes two thirds of the vehicle's exterior; the greenhouse the remaining third. The roof line slopes markedly toward the ground; the D-posts resemble those of a coupe. 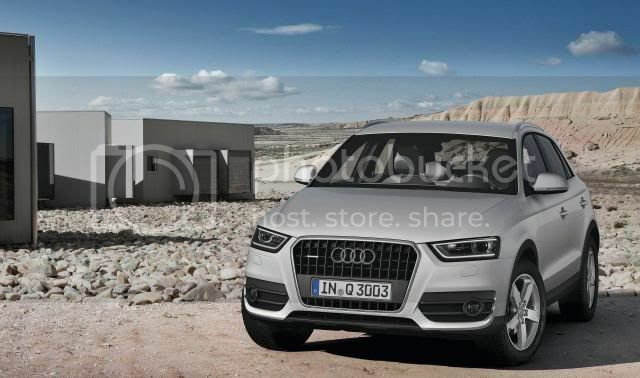 Despite its coupe-like styling, the Audi Q3 is clearly recognizable as a member of the Q family. 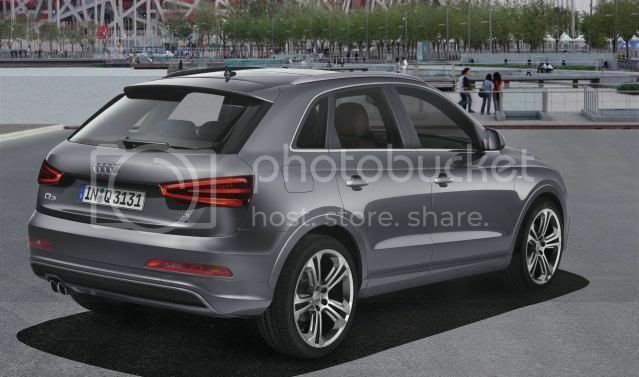 Its wraparound tailgate is similar in design to those on its larger siblings, the Q5 and Q7. In conjunction with the xenon plus headlights, LED light strips serve as tail lights. The exhaust system's tailpipes terminate to the left and to the right. 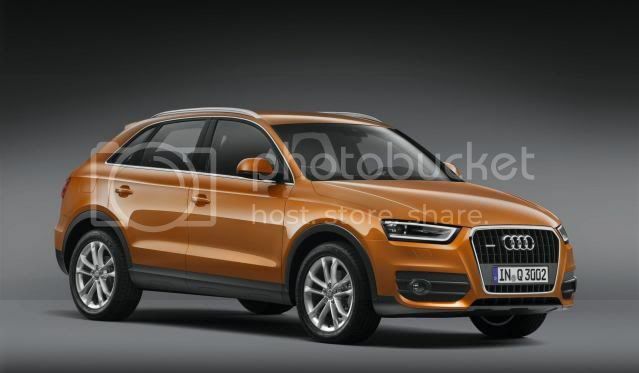 The Audi Q3 is 4.39 meters in length (14.4 ft), 1.83 meters in width (6.0 ft), and 1.60 meters (5.25 ft) in height - roof rail included. Its drag coefficient of 0.32 raises the bar in this segment; moreover, its underbody fairing facilitates optimum airflow - underneath the vehicle, too. Audi offers twelve different colors of paint for its new compact SUV, and five customization options are available regarding add-on parts. In addition to the standard black add-on parts, customers can choose either a full paint finish or color-contrasting add-on parts in anthracite gray for the underbody guard and wheel arches. 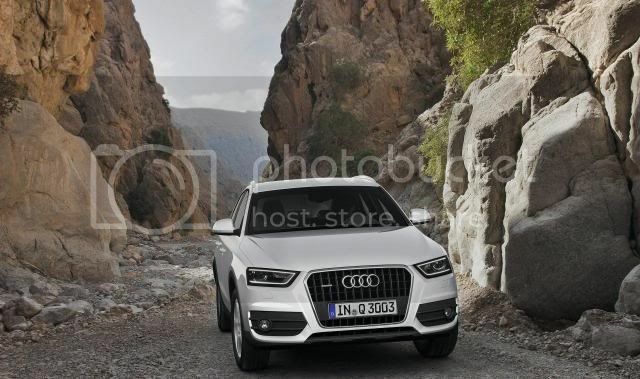 The Audi exclusive off-road styling package gives the Q3 a broad and powerful look. 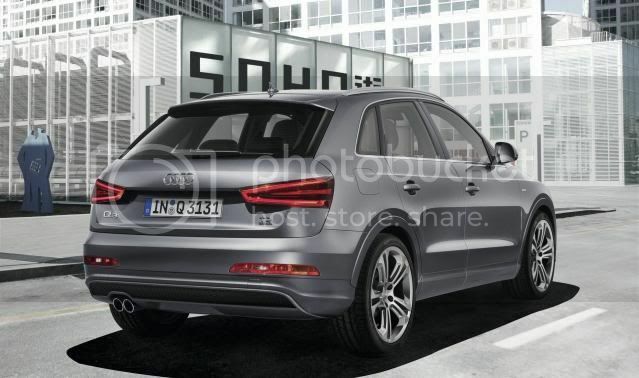 The S line exterior package, conversely, represents classic Audi and appeals to especially sporty customers. This compact SUV's body is very rigid and impact-resistant yet quiet on the road. The passenger cell incorporates a great many tailored blanks as well as extremely strong hot-formed steel. These components are quite thin, which reduces the vehicle's weight. 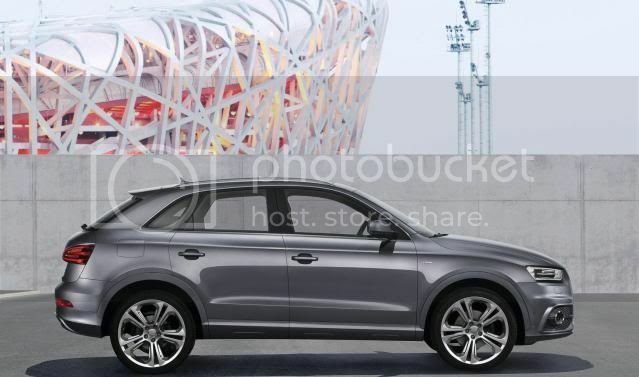 The tailgate and the engine hood of the Audi Q3 are made of aluminum. The front-wheel drive version of Audi's latest model weighs less than 1,500 kilograms (3,307 lb). 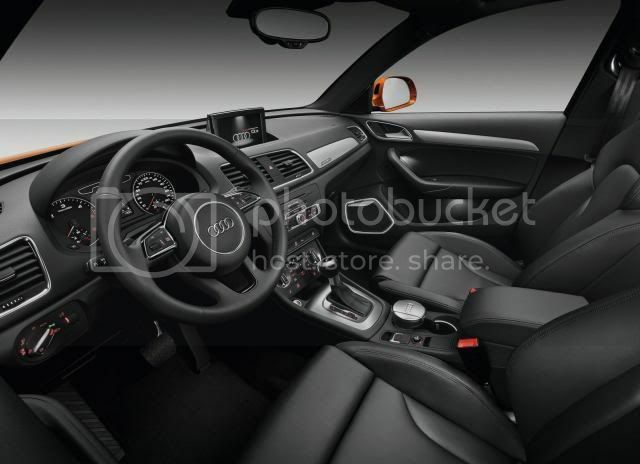 The roomy interior of the Audi Q3 harmoniously mirrors the exterior design's sinewy yet gentle styling. A large curve, known as a wrap-around, encapsulates the driver and the front-seat passenger - a feature familiar from the brand's large model lines. The dashboard's horizontal layout underscores its width. An optional color display (as large as seven inches diagonally) on the instrument panel is a first in the Q series. Workmanship of uncompromising quality is every bit a matter of pride at Audi as is stylistic confidence in the selection of colors and materials. 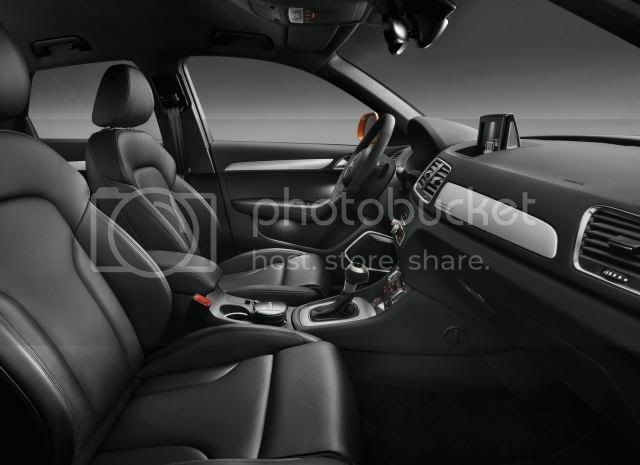 Five color concepts are available for the interior: black, gray, beige, and two shades of brown. With regard to upholstery, there are three fabric designs and three leather designs. For the inlays, there are four optional versions - including open-pored larch inlays and new silvery aluminum inlays with supplementary wire mesh and a 3D look. The S line sports package offers an additional inlay and bathes the entire interior in a cool black color. 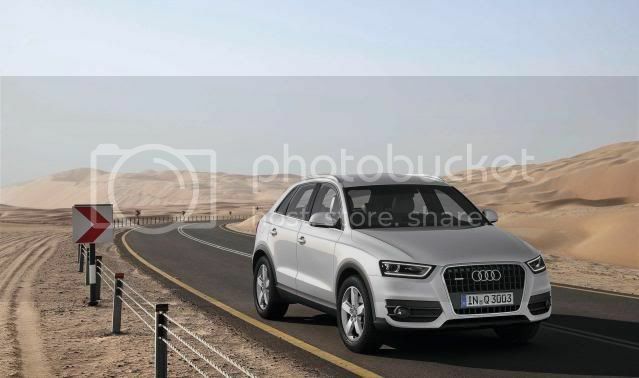 Operating the Audi Q3 entails straightforward logic and intuitive user-friendliness - typical Audi. It is simple to read the instruments at a glance; the seats provide outstanding support and comfort. The chorus sound system with an AUX-IN input is standard, as are an air conditioner and an extensive array of occupant restraint systems. 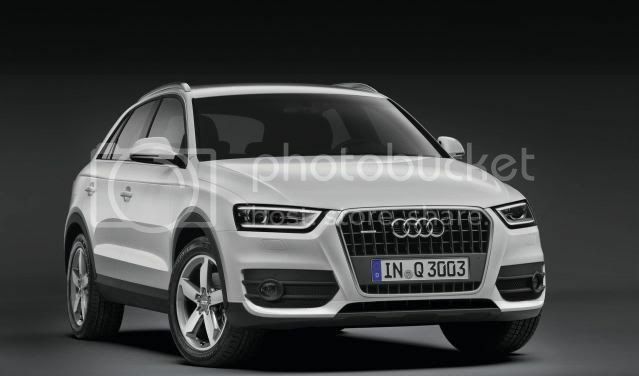 Numerous high-end options attest to the excellent technological standards of the Q3. They include an on-board computer with efficiency program, an ambient lighting package with a great many LEDs, a panoramic glass roof, a storage package, sports seats, electrically adjustable and heated seats, a convenience key for entering the vehicle and starting the engine at the touch of a button, two-zone deluxe automatic air conditioning, tinted rear windows, and a three-spoke leather steering wheel in a new Q-specific look. Adaptive light technology for the xenon plus headlights and the high-beam assistant intelligently illuminate the dark road ahead. 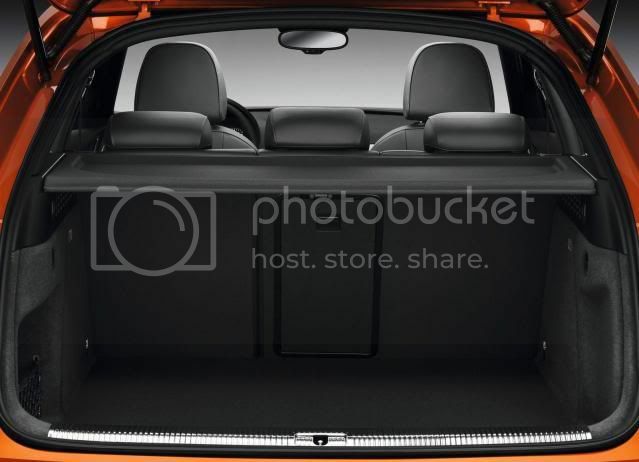 The Audi Q3 has a luggage compartment that offers plenty of room for recreational and sports equipment. Its 460-liter (16.24 cu ft) capacity swells to a volume of 1,365 liters (48.2 cu ft) with the split rear seat backrests folded down. A roof rail is standard. A wealth of options make driving this compact SUV even better. Among them: a luggage compartment package, a front-passenger seat with a folding seat back, a reversible loadliner, a reversible mat, a loading-sill protector made of stainless steel, a load-through hatch in the rear seat backrest, and a ski bag. 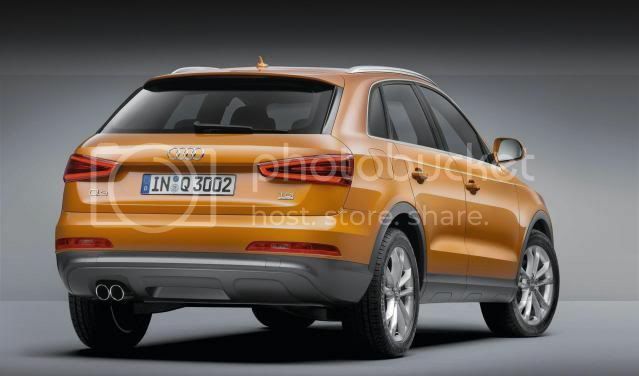 The Audi Q3 can tow a trailer weighing as much as 2.0 metric tons (4,400 lb). 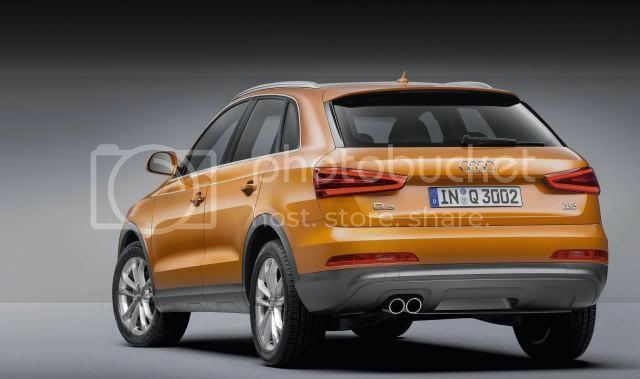 The Audi Q3 will be available with one of four engines. Upon its market launch, two gasoline engines and one TDI engine will be offered; a second TDI engine will appear a little later. All four of the four-cylinder engines will have a displacement of 2.0 liters. They all deliver great output and terrific torque from 280 to 380 Nm (206.52 to 280.27 lb-ft). In addition, all engines combine Audi's mighty efficiency technologies: direct fuel injection, turbocharging, the start-stop system, and the energy recovery system. 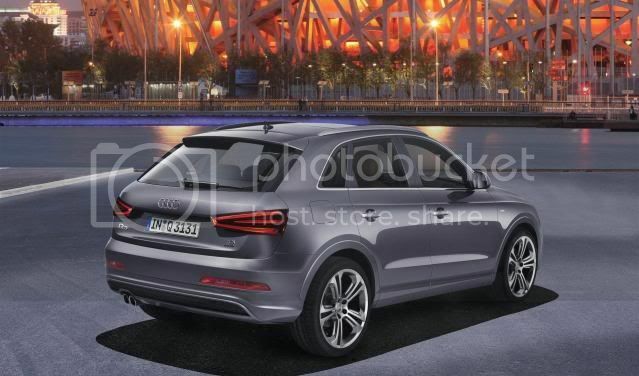 The Q3 2.0 TDI with 103 kW (140 hp) will roll off the assembly line with front-wheel drive and - just like the Q3 2.0 TFSI quattro with 125 kW (170 hp) - with a six-speed manual transmission. 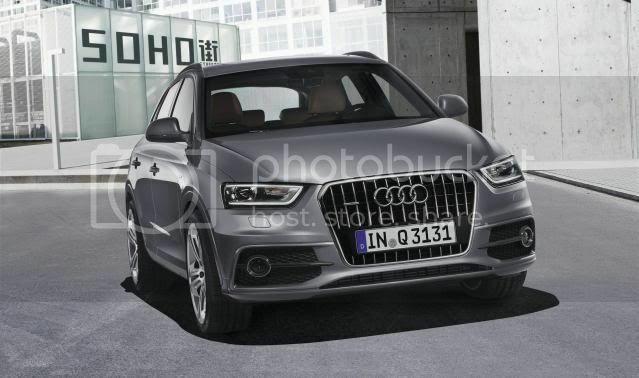 The 130 kW (177 hp) TDI engine and the 155 kW (211 hp) TFSI combine quattro drive with a dynamic seven-speed S tronic. Gears can also be shifted via optional paddles on the steering wheel. When a driver selects efficiency mode in Audi drive select, the S tronic disengages a clutch while the sporty SUV is coasting and allows it to roll freely - which further enhances fuel efficiency. 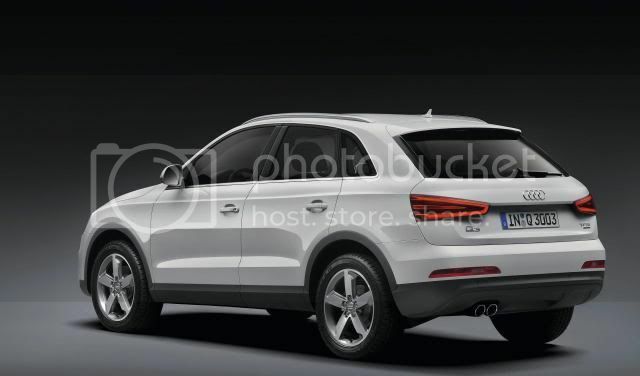 The sportiest player in this segment, the Audi Q3 has a chassis that combines outstanding safety with excellent comfort and is well-balanced and harmonious. Its four-link rear suspension handles longitudinal and lateral forces separately. The electromechanical power steering performs responsively, precisely and very efficiently; the electromechanical parking brake boosts convenience. Audi drive select is available as an option for all Q3 engine types. It accesses the accelerator and steering. When ordered with the equipment options S tronic, adaptive light and Audi adaptive cruise control, these are influenced, too. The driver can vary the function of these systems between the comfort, auto, dynamic and efficiency modes. In efficiency mode, the air conditioner and cruise control operate with the specific aim of saving fuel. 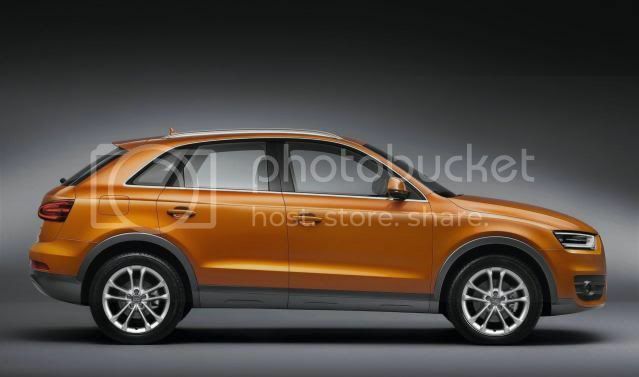 The Audi Q3 leaves the factory with 16-inch lightweight alloy wheels fitted with 215/65 tires; the top-of-the-line engines are available with 17-inch wheels. 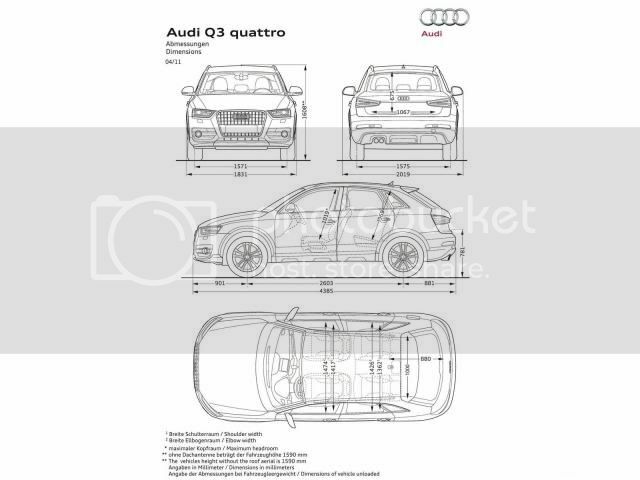 Upon request, Audi can supply wheels between 17 and 19 inches, some of which are quattro GmbH products. All tires are distinguished by low rolling resistance; the brakes are strong and stable - and ventilated at the front. 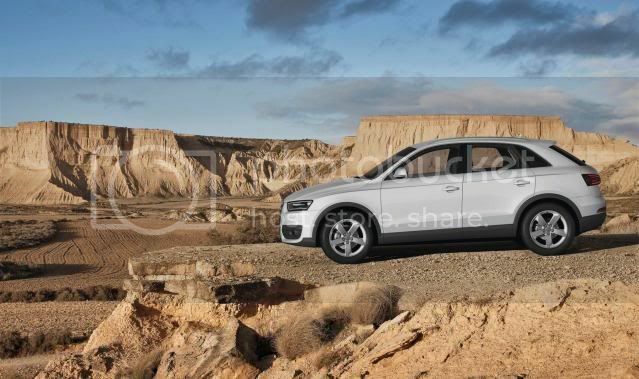 Thanks to its generous ground clearance of 17 centimeters (6.69 in), the Q3 can also tackle rough terrain. In the Audi Q3, the electronic stabilization program (ESP) integrates an electronic differential lock, which - at the vehicle's cornering limit - regulates the distribution of drive torques to the wheels via minor, barely perceptible braking. Regardless of version, the ESP offers trailer stabilization. 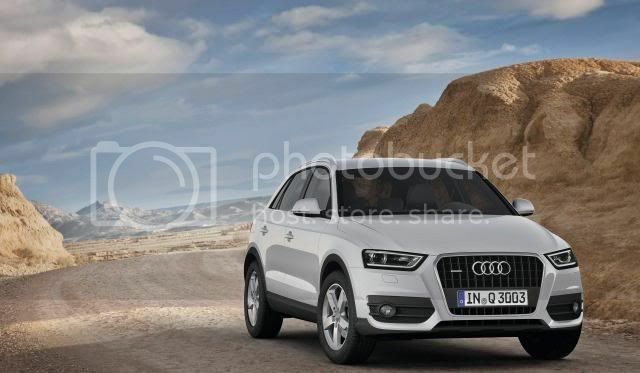 Upon request, Audi will supply the Q3 with the hold assist function; at a later time, a hill hold assist system will maintain a constant vehicle speed while driving downhill. 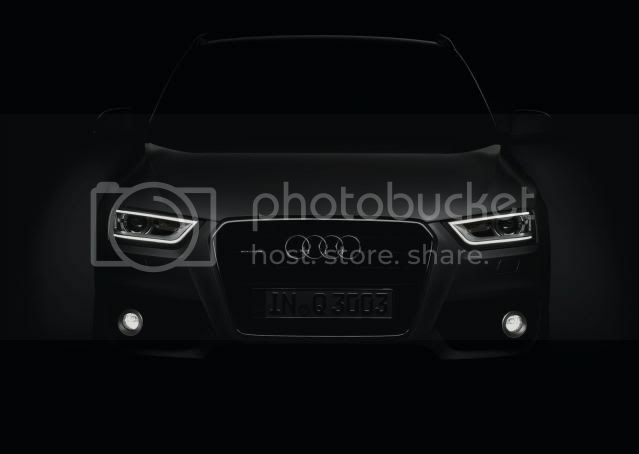 Audi will provide a full range of infotainment technologies for the Q3. 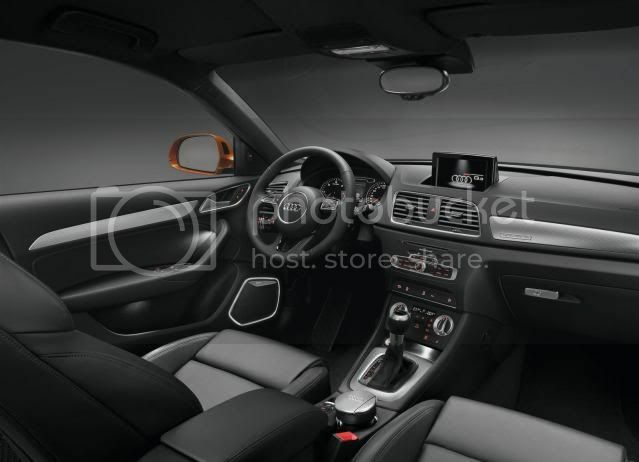 The connectivity package, for instance, includes the Audi music interface for integrating mobile playback devices and a GPS interface, which the customer can activate at once or at a later date. Many additional solutions are taken straight from the luxury class. For example, the Bose surround sound system integrates 14 speakers, and the woofers up front illuminate handsomely when the interior darkens. The high-end infotainment cornerstone is the large MMI plus, a hard drive navigation system. Its manually extendable seven-inch color screen displays high-resolution 3D images; the system can also process whole-word voice input. At a later date, it will become possible to link the MMI navigation plus system with the online Bluetooth car phone, which integrates a UMTS module. 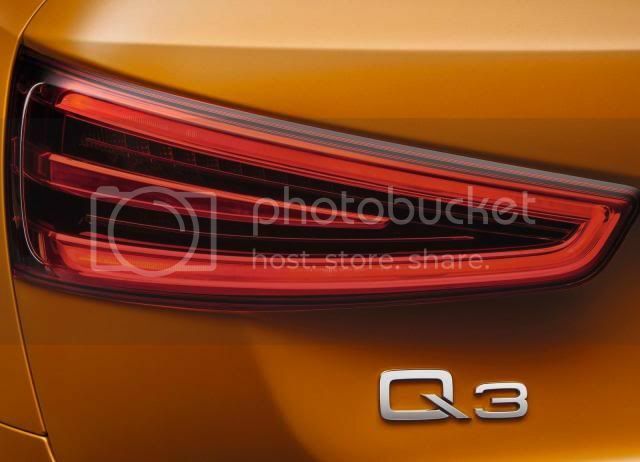 And thanks to Audi connect, the Internet will be on board the Q3 - including special services. A WLAN hotspot enables mobile terminal devices so that passengers can enjoy unrestricted Internet connectivity on the road. With the online Bluetooth car phone, a route chosen by the driver can be portrayed on a Google Earth map. Audi's online traffic information keeps drivers abreast of the traffic situation ahead. Information is up-to-the-minute and precise because data is generated from a great many vehicles. Assistance systems for the Q3 also come from higher-end model lines. Audi side assist employs radar to help drivers change lanes and Audi active lane assist helps drivers remain in their lane by slightly correcting steering, if necessary. The optional driver information system's screen shows important road signs thanks to the camera-based speed limit display. No less than five systems are ready to help drivers park. The park assist system does the steering for drivers while the vehicle is reversing into right-angle or parallel spaces; if necessary, it will execute several steering steps. Its twelve ultrasonic sensors detect obstacles such as concrete pillars, even if they are off to the vehicle's side. The assistant's software memorizes the obstacles' locations and alerts the driver to them before the parking space is vacated.